Nathaniel and Shona explore the many food trucks that Melbourne has to offer! We are On Air Saturdays from 6-7pm on 90.7FM, We also have a Facebook page where you can see all of the food and watch our weekly challenge and punishment videos so like us up! 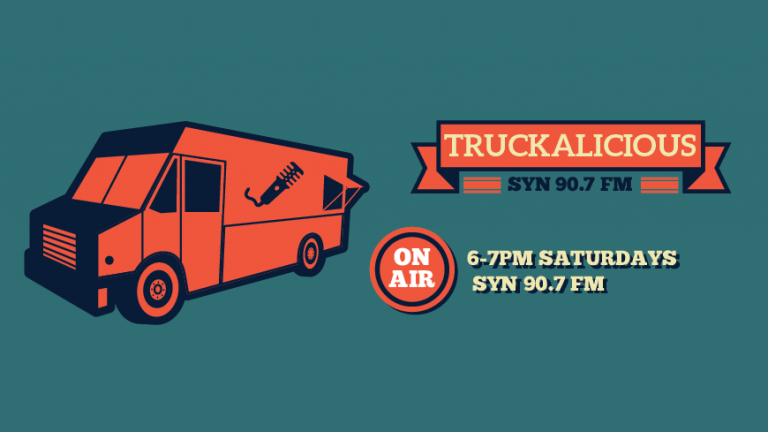 Truckalicious every Saturday from 6pm AEST. This week we visit El Chivi and titillate our taste buds with Uruguayan steak sandwiches – it would be a missed steak if you missed this episode! This week we visit Ma Crêpe Chérie and try their crepes. Holy crepe they were amazing – you don’t want to miss this episode! This week we visit The Real Jerk Food Truck and explore Caribbean and Jamaican cuisine. Here’s a tip if you say beer can with a Jamaican accent it sounds like bacon! This week we visit the Bread and Meat Co Food Truck and try an array of gourmet sandwiches, even though the meat was slow cooked – we sure as hell ate it fast! This week we wonder why have abs when you can have kebabs or if can we stick it to the kebabs with a souva with the ultimate challenge of kebabs vs souva! This week we’re on a roll and visited the Loaded Gourmet Hotdogs Food Truck! This week we visited the Avocado Hut, you have guac to listen to this! This week we visited Footscray Coffee and Donuts, you donut want to miss this one! This week we visited Poketime Melbourne so get your grass skirts ready because this week we’re goin’ Hawaiian!